Homo antecessor is a proposed archaic human species of the Lower Paleolithic, known to have been present in Western Europe (Spain, England and France) between about 1.2 million and 0.8 million years ago (Mya). It was described in 1997 by Eudald Carbonell, Juan Luis Arsuaga and J. M. Bermúdez de Castro, who based on its "unique mix of modern and primitive traits" classified it as a previously unknown archaic human species. The fossils associated with Homo antecessor represent the oldest direct fossil record of the presence of Homo in Europe. The species name antecessor proposed in 1997 is a Latin word meaning "predecessor", or "vanguard, scout, pioneer". Authors who do not accept H. antecessor as a separate species consider the fossils in question an early form of H. heidelbergensis or as a European variety of H. erectus. Forensic reconstruction by Élisabeth Daynès (2014), Museo de la Evolución Humana, Burgos. Daynes at first declined to produce a reconstruction because the fossil evidence was too fragmentary, but she delivered this tentative reconstruction in 2014 based on a number of fossils from Gran Dolina, Atapuerca (ATD6-15 frontal bone, ATD6-69 maxilla, ATD-96 mandible), dated to c. 850 ka. The reconstruction is that of an adolescent male of c. 10 years (the "Boy of Gran Dolina"). H. antecessor has been proposed as a chronospecies intermediate between H. erectus (c. 1.9–1.4 Mya) and H. heidelbergensis (c. 0.8–0.3 Mya). While H. heidelbergensis is widely accepted as the immediate predecessor of H. neanderthalensis, and possibly H. sapiens, the derivation of H. heidelbergensis from H. antecessor is debatable. H. antecessor's discoverers suggested H. antecessor as a derivation of African H. erectus (H. ergaster) which would have migrated to the Iberian Peninsula at some point before 1.2 Mya, and developed into H. heidelbergensis by 0.8 Mya, and further into H. neanderthalensis after 0.3 Mya. Other authors would classify H. antecessor as an early form of H. heidelbergensis, which by the taxonomic principle of priority would extend the range of H. heidelbergensis to 1.2–0.3 Mya. Klein (2009) deems H. antecessor "an unlikely ancestor for H. heidelbergensis", interpreting the presence of H. antecessor an early "failed attempt to colonize southern Europe". The classification of H. antecessor as a separate species remains open to debate as the fossil record is fragmentary, and especially as no complete skull has been found, with only fourteen fragments and lower jaw bones known. Since the anatomical parallels to H. sapiens were found in juveniles or children, the possibility has been argued "that H. antecessor adults didn't really look much like H. sapiens at all". H. antecessor was about 1.6–1.8 m (5½–6 feet) tall, and males weighed roughly 90 kg (200 pounds). Their brain sizes were roughly 1,000 to 1,150 cm³, smaller than the 1,350 cm³ average of modern humans. Due to fossil scarcity, very little more is known about the physiology of H. antecessor, yet it was likely to have been more robust than H. heidelbergensis. According to Juan Luis Arsuaga, one of the co-directors of the excavation in Burgos and reported in a Spanish newspaper,[clarification needed]H. antecessor might have been right-handed, a trait that makes the species different from the other apes. This hypothesis is based on tomography techniques. Arsuaga also claims that the frequency range of audition is similar to H. sapiens, which makes him suspect that H. antecessor used a symbolic language and was able to reason. Arsuaga's team is currently pursuing a DNA map of H. antecessor. Based on teeth eruption pattern, the researchers think that H. antecessor had the same development stages as H. sapiens, though probably at a faster pace. Other significant features demonstrated by the species are a protruding occipital bun, a low forehead, and a lack of a strong chin. Some of the remains are almost indistinguishable from the fossil attributable to the 1.5-million-year-old Turkana Boy, belonging to H. ergaster. At the site were numerous examples of cuts where the flesh had been flensed from the bones, based on which it has been argued that H. antecessor may have practiced cannibalism. The only known fossils of H. antecessor were found at two sites in the Sierra de Atapuerca region of northern Spain (Gran Dolina and Sima del Elefante). In 1994 and 1995, a total of 80 fossils of six individuals who may have belonged to the species were found. The type specimen for H. antecessor is ATD 6-5, dating to approximately 780,000 years ago. Evidence of early human presence in England and France has later been tentatively associated with H. antecessor purely on chronological grounds and not based on anatomical evidence. Archaeologist Eudald Carbonell of the Universidad Rovira i Virgili in Tarragona, Spain and palaeoanthropologist Juan Luis Arsuaga of the Complutense University of Madrid discovered Homo antecessor remains at the Gran Dolina site in the Sierra de Atapuerca, east of Burgos, Spain. The H. antecessor remains have been found in level 6 (TD6) of the Gran Dolina site. More than 80 bone fragments from six individuals were uncovered in 1994 and 1995. The site also had included approximately 200 stone tools and 300 animal bones. Stone tools including a stone carved knife were found along with the ancient hominin remains. All these remains were dated at least 900,000 years old. The best-preserved remains are ATD6-15 and ATD6-69, a frontal bone and a maxilla (upper jawbone) of an adolescent male, aged c. 10 years, dubbed the "Gran Dolina Boy" (el chico de la Gran Dolina)). Based on palaeomagnetic measurements, it is thought to be older than 857–780 ka. The sediment of Gran Dolina was dated at 900,000 years old in 2014. On June 29, 2007, Spanish researchers working at the Sima del Elefante (“Pit of the Elephant”) site in the Atapuerca Mountains of Spain announced that they had recovered a molar dated to 1.2 to 1.1 million years ago. The molar was described as "well worn" and from an individual between 20 and 25 years of age. Additional findings announced on 27 March 2008 included a mandible fragment, stone flakes, and evidence of animal bone processing. 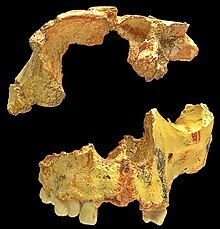 These remains are the oldest hominid remains in Europe after Homo erectus georgicus from Dmanisi, Georgia (dated 1.8 million years ago) and an infant tooth from Orce, Spain which has not received species assignation (1.4 million years). Before the 1990s, the oldest evidence of archaic human presence in Europe were Homo heidelbergensis fossils, dated ca. 600 ka (Mauer 1). Evidence of human presence significantly predating 600 ka discovered since the 1990s is tentatively associated with the proposed designation H. antecessor. Stone tools found in France suggest that Homo erectus may have reached Europe as early as 1.6 Mya, although the oldest known human fossil found in Europe remains and the oldest positive identification of H. erectus in Europe is Tautavel Man, a late H. erectus specimen dated to 450 ka. In 2005, flint tools and teeth from the same strata as fossils of the water vole Mimomys savini, a key dating species, were found in the cliffs at Pakefield near Lowestoft in Suffolk. This suggests that archaic humans existed in England 700,000 years ago, potentially a cross between Homo antecessor and Homo heidelbergensis. In 2010, stone tool finds were reported in Happisburgh, Norfolk, England, dated to about 950,000 years ago, the earliest known evidence for hominin presence in Northern Europe. Happisburgh is close to the 53rd parallel north, which also represents the known northern limit of the Neanderthal range in the Middle Paleolithic. In May 2013, sets of fossilized footprints were discovered in an estuary at Happisburgh. Dating to about 800,000 years ago, they are thought to have been left by a small group of people, including several children and one adult male. The tracks are considered the oldest human footprints outside Africa and the first direct evidence of humans in this time period in northern Europe; previously the presence of ancient humans in northern Europe was known only from their stone tools. The tracks were preserved in a layer of soft laminated silt and exposed through erosion by the sea. Although the tracks themselves were destroyed within two weeks by continued erosion, researchers used photogrammetry to record three-dimensional images of them. Twenty tools dating back to the Paleolithic (pebble culture, 1.6 million years ago) were found in 2008. ^ Bermudez de Castro; Arsuaga; Carbonell; Rosas; Martinez; Mosquera (1997). "A hominid from the Lower Pleistocene of Atapuerca, Spain: possible ancestor to neandertals and modern humans". Science. 276 (5317): 1392–1395. doi:10.1126/science.276.5317.1392. PMID 9162001. ^ a b c Wayman, Erin (November 26, 2011). "Homo antecessor: Common Ancestor of Humans and Neanderthals?". Smithsonian. Retrieved December 9, 2015. ^ Wayman, Erin (November 26, 2011). "Homo antecessor: Common Ancestor of Humans and Neanderthals? By Erin Wayman H. antessor's discoverers—including José Bermúdez de Castro…". smithsonian.com. Retrieved December 9, 2015. Carretero, JM; Lorenzo, C; Arsuaga, JL (October 1, 1999). "Axial and appendicular skeleton of Homo antecessor". J. Hum. Evol. 37 (3–4): 459–99. doi:10.1006/jhev.1999.0342. PMID 10496997. ^ "... a speciation event could have occurred in Africa/Western Eurasia, originating a new Homo clade [...] Homo antecessor [...] could be a side branch of this clade placed at the westernmost region of the Eurasian continent". Bermúdez-de-Castro, José-María (May 23, 2015). "Homo antecessor: The state of the art eighteen years later". Quaternary International. 433: 22–31. doi:10.1016/j.quaint.2015.03.049. Retrieved December 10, 2015. ^ "Homo antecessor". Australian Museum. November 26, 2011. Retrieved December 9, 2015. ^ Klein, Richard. 2009. "Hominin Disperals in the Old World" in The Human Past, ed. Chris Scarre, 2nd ed., p. 108. ^ Sarmiento, Esteban E.; Sawyer, Gary J.; Mowbray, Kenneth; Milner, Richard; Deak, Viktor; Johanson, Donald C.; Tattersall, Ian (2007). The Last Human: A Guide to Twenty-two Species of Extinct Humans By Esteban E. Sarmiento, Gary J. Sawyer, Richard Milner, Viktor Deak, Ian Tattersall. ISBN 9780300100471. Retrieved December 10, 2015. ^ Fernández-Jalvo, Y.; Díez, J. C.; Cáceres, I.; Rosell, J. (September 1999). "Human cannibalism in the Early Pleistocene of Europe (Gran Dolina, Sierra de Atapuerca, Burgos, Spain)". Journal of Human Evolution. 37 (34): 591–622. doi:10.1006/jhev.1999.0324. PMID 10497001. ^ "Homo antecessor". eFossils. Retrieved December 9, 2015. ^ Parés, J.M. (July 24, 2013). "Reassessing the age of Atapuerca-TD6 (Spain): New paleomagnetic results by L. Arnolda, M. Duvala, M. Demuroa, A. Pérez-Gonzáleza, J.M. Bermúdez de Castro, E. Carbonell, J.L. Arsuaga". Journal of Archaeological Science. 40 (12): 4586–4595. doi:10.1016/j.jas.2013.06.013. Retrieved 3 August 2013. ^ J. M. Bermúdez de Castro, El chico de la Gran Dolina (2002). ^ Falguères, Christophe; Bahain, J.; Yokoyama, Y.; Arsuaga, J.; Bermudez de Castro, J.; Carbonell, E.; Bischoff, J.; Dolo, J. (1999). "Earliest humans in Europe: the age of TD6 Gran Dolina, Atapuerca, Spain". Journal of Human Evolution. 37 (3–4): 343–352 . doi:10.1006/jhev.1999.0326. PMID 10496991. ^ "Dating is refined for the Atapuerca site where Homo antecessor appeared". Science X Network. February 7, 2014. Retrieved December 10, 2015. ^ Carbonell, Eudald (2008-03-27). "The first hominin of Europe". Nature. 452 (7186): 465–469. doi:10.1038/nature06815. PMID 18368116. Retrieved 2008-03-26. ^ Toro-Moyano, I; Martínez-Navarro, B; Agustí, J; Souday, C; Bermúdez; de Castro, JM; Martinón-Torres, M; Fajardo, B; Duval, M; Falguères, C; Oms, O; Parés, JM; Anadón, P; Julià, R; García-Aguilar, JM; Moigne, AM; Espigares, MP; Ros-Montoya, S; Palmqvist, P (2013). "The oldest human fossil in Europe, from Orce (Spain)". J Hum Evol. 65 (1): 1–9. doi:10.1016/j.jhevol.2013.01.012. hdl:10261/84112. PMID 23481345. ^ Good. C & Plouviez. J (2007) The Archaeology of the Suffolk Coast Archived 2012-03-08 at the Wayback Machine Suffolk County Council Archaeological Service [online]. Retrieved 2009-11-28. ^ Ashton, N; Lewis, SG; De Groote, I; Duffy, SM; Bates, M; et al. (2014). "Hominin Footprints from Early Pleistocene Deposits at Happisburgh, UK". PLoS ONE. 9 (2): e88329. doi:10.1371/journal.pone.0088329. PMC 3917592. PMID 24516637. ^ Ashton, Nicholas (7 February 2014). "The earliest human footprints outside Africa". British Museum. Archived from the original on 7 February 2014. Retrieved 2014-02-07. ^ Jones, Tim (2009-12-17). "Lithic Assemblage Dated to 1.57 Million Years Found at Lézignan-la-Cébe, Southern France «". Anthropology.net. Retrieved 21 June 2012. Wikimedia Commons has media related to Homo antecessor.